I like crisp Bacon and the Crackling you get from roast pork. I love how both are crunchy but dissolves in your mouth. However, I’ve never been big fan of pork. Growing up, I was always served pork that was overcooked, stringy and dry. It was the convention for pork; pork had to be served well done or else you can contract parasites. However, I was told by my doctor that unless the pork was from a wild pig or from an unregulated farm where pigs eat whatever they find, the chance of contracting a parasite from under cooked pork purchased from a grocery store would be minimal. Despite the overwhelming evidence that pork can be served medium or medium well most people still over cook it, my parents included. In fact one of the best pork dishes I had was Chinese BBQ pork they had purchased which was cooked to medium well. It was juicy, flavourful and tender. That lasted 2 minutes, as soon as my parents discovered the under cooked pork, they nuke the crap out of it and it became a big plate of chewy and dry meat. 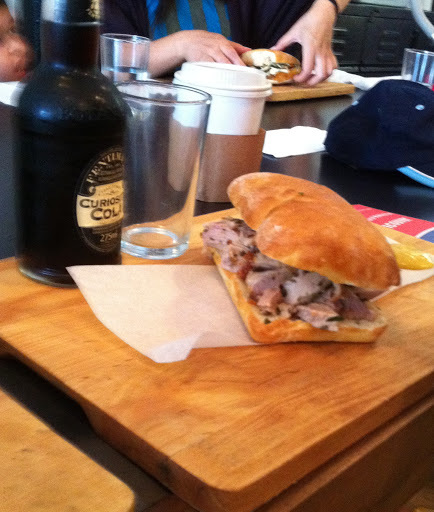 So what impressed me about Meat & Bread is that I actually really like their Porchetta (Italian Roast Pork) sandwich. It’s a very simple sandwich consisting of bread, roast pork (and it’s crackling sprinkled on top) and a heaping tablespoon of salsa verde. With such few ingredients, each component needs to be prepared well. There’s no hiding if the pork is overcooked, there is nothing else that can help mask it or add enough moisture. I have had the Porchetta sandwich a few times over the last year and each time it’s been consistently good. The crackling is appropriately brittle and behaves, as it should – an initial crunch and then a melt into the other ingredients. The skin needs to be scored just enough to release the fat but not too deep as to allow juices to leak out during the cooking process. The correcting cooking temperature needs to be selected to draw all moisture out of the skin and allow the fat to melt and fry the skin BUT it cannot be so high it quickly overcooks the meat. 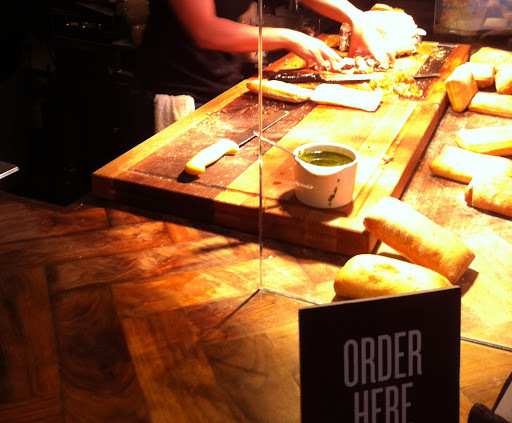 It’s clear that the people at Meat & Bread know how to roast pork. The pork itself is ridiculously moist and is seasoned well. As you can see the pork is pink. From experience, I know part of the pink is from the seasoning they use. I don’t know the reason behind it but if you salt pork aggressively, the salt changes the meat and doesn’t allow it to turn white during the cooking process. However some of the rosy hue is from the fact they don’t overcook the roast. Given the tender texture of the meat, I don’t think they come close to serving their pork well done. If I had to guess, I think they serve their pork near medium well. 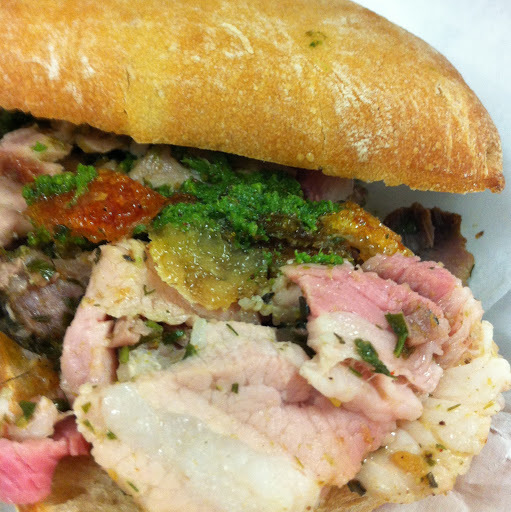 The well-prepared roast pork and its crispy skin are the stars of the sandwich. Meat & Bread’s Porchetta Sandwich seems like a uncomplicated creation but actually needs a lot skill to prepare which the Meat & Bread crew have in spades. Previous Post Limited Time Offer! The Vancouver Christmas Market – Condiment Udders & the Glutton Cup!